Due to its size and geography, California is home to two regional VOADs and numerous county VOADs. NorCal VOAD is an association of organizations and their government partners that provide disaster-related services to residents throughout the 48 northernmost counties in the state. It also serves as a convening body for local VOADs in the region. 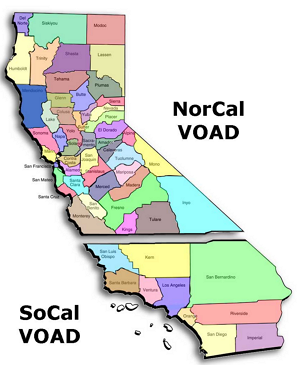 SoCal VOAD is an association of local VOADs in the ten southern-most counties in the state. If you are interested in joining a VOAD in this region, contact the VOAD leadership listed below for your operational area. Click here to display a list of VOAD contacts throughout California. Click here to find VOAD contacts in the rest of the country.